Noto is a free text editor available on macOS. It is not as full-featured as some of the other alternatives like CotEditor or the free version of BBEdit. What it lacks in features, Noto makes up in speed. If you are a person who lives in text files, you must have a dedicated text editor which you use. This product is not for you. You have time and energy invested in learning the inner workings of your text editor and there is no reason for you to use a simple solution like Noto. On the other hand, if you are not wedded to text files and are looking for a simple text editor which will let you deal with the occasional text file, Noto should fit your needs. Noto has extensive encoding support. That means Noto can support files containing text and characters from many different scripts and encodings. It is equally comfortable with Japanese characters and mathematical symbols, or Windows, macOS, and Unix text files. Noto does "smart multi-selection." Hold down the ⌘ key and highlight multiple selections of text. You can now indent or un-indent the selected text with spaces or tabs. Noto shows invisible characters. View>Show Invisible Characters, shows you the gremlins hidden in your text files. Useful if you are copying text from other programs into Noto. Noto supports Versioning. You can revert back to a previous version of your document through Noto's support for the macOS feature of Versions. Noto has themes. You can get some additional themes from here. You can also make your own with instructions from here. You get to choose your own font. Noto lets you assign spaces instead of tabs. You get to specify number of spaces for each tab. Noto supports the macOS features of turning two spaces into a period and it capitalizes the first letter of each new sentence if you have that selected in System Preferences>Keyboard>Text preference pane. In case you have internalized this "bad typing behavior" (I am guilty of this), this is a great feature. Noto supports themes and the implementation though minimal is effective and user-customizable. Noto is competent software. 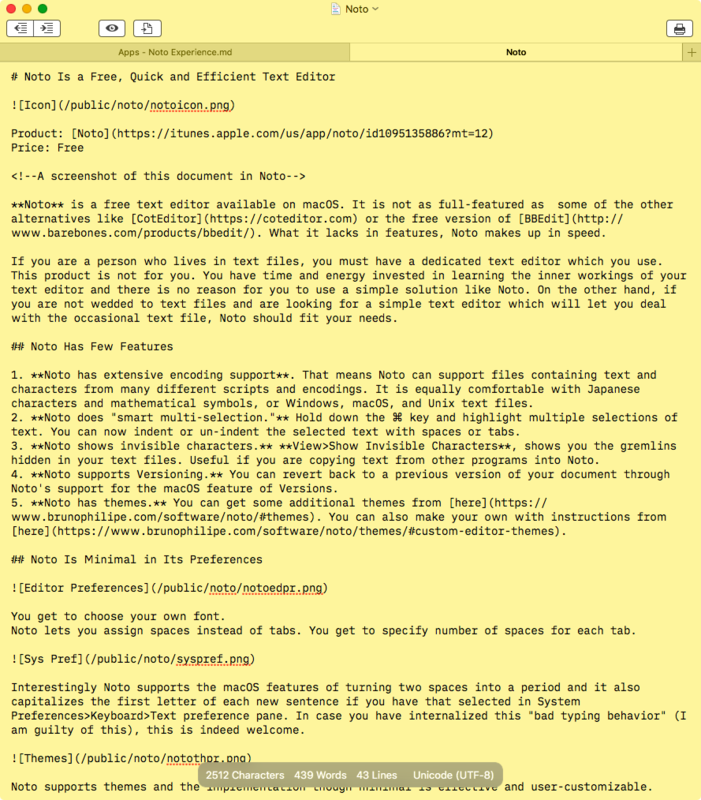 If you are looking for a simple text editor, it fits the bill. I love it. It is quick and easy and a pleasure to use.